So you’re looking for something to entertain and stimulate your little one? Enter baby play mats! Whether you call them an activity play mat, playmat, play gym for babies, an activity gym for babies, an activity floor mat or a combination of these words, it all equates to the same thing – activity mats for infants are a great way to ensure your baby has lots of fun and learns while you can take a break to do other things. 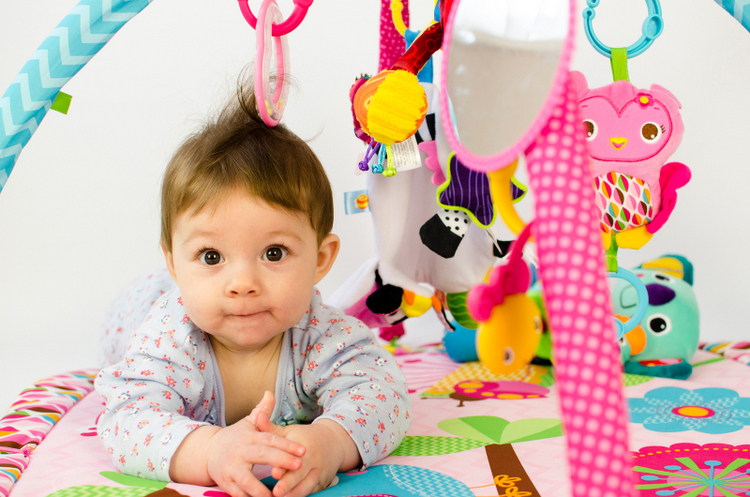 What is a Baby Play Mat? Play mats for infants are basically a padded mat that goes on the ground that has some type of activity for the baby to do while laying there. 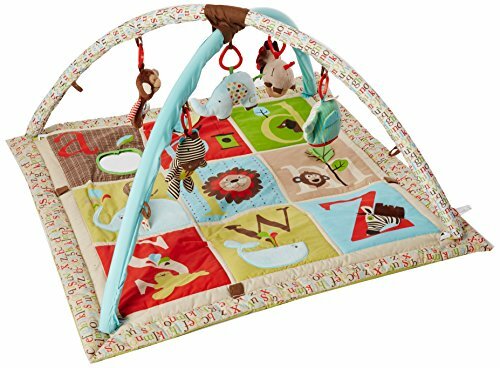 There is a huge variation on what this might be – some baby play mats are full of hanging toys, mirrors and other things for them to touch, swing and examine. Others also have music and lights. They range from being quite simple to quite extravagant and it can be overwhelming picking the best play mat for babies as there are so many choices. Hopefully, this guide will help! Also keep in mind that baby play mats have many names – they are also often referred to as activity gyms for babies, activity play gym, activity blanket for babies, activity gym… the list goes on and on but these are all essentially the same thing. So whether you are looking for the best play mat, best activity gym, best play gym or the best floor mats for babies – the answer is the same and you should find it here! But Wait, do you actually need a Play Mat? There are so many things to buy with a new baby and you may be wondering if you need a play mat at all. I wouldn’t say they are absolutely essential – of course you and your baby will survive without one. However, they are so useful. Babies need to be held a lot and anything that can give you some time to wash some dishes, get dressed or have a shower is a big winner in my book – a baby play mat will help make all of that possible! A play mat works best for babies aged from 3 months until the start crawling – at that point you can expect them to start crawling off the floor mat for babies to reach other things. A newborn play mat can seem useful but it’s not really necessary until they have developed some hand eye coordination. Here is a quick comparison of all of the best play mats listed in this guide so you can quickly compare the price and ratings. Play mats do not differ all that much – what you see is basically what you get. 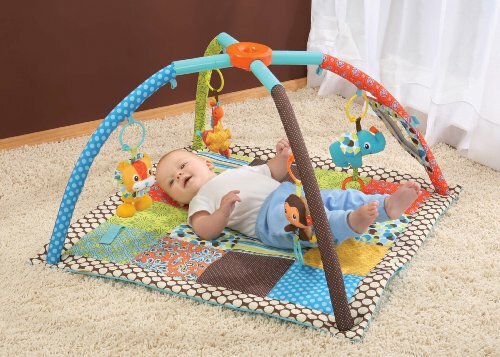 There are some elements you will want to keep in mind when looking at activity mats for babies. Comfort – is the play mat well padded? Soft play mats for babies that will still be comfortable on hard floors are a good idea. Non slip – you don’t want the play mat to slip all over the place once baby is on the move. Colors – bright, vivid colors can work the best to hold your baby’s attention. Variety – a variety of different activities can help develop baby’s auditory, visual and tactile senses while they play – for example, something musical, rattles, vibrating toys, crinkly surfaces, smooth and rough surfaces – variety works best. This will also help to entertain your baby for longer. Size – ensure you have a play mat that is an appropriate size. 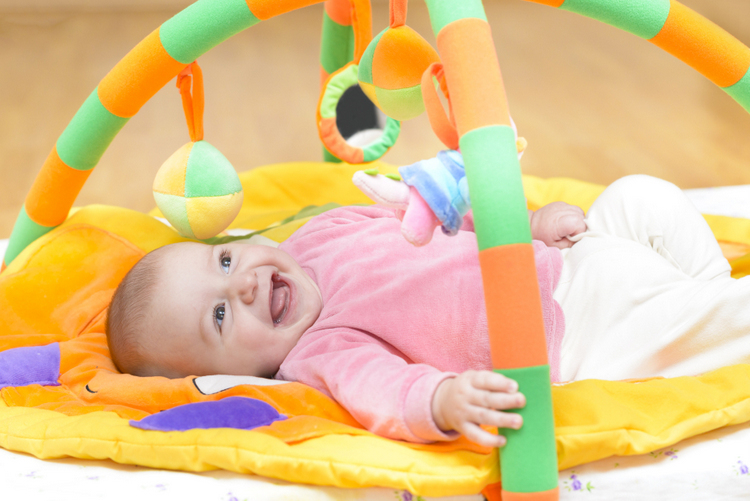 Although an extra large play mat for babies may be tempting, remember that it’s also often not necessary as they can’t move around much anyway. Portability – I recommend a foldable play mat so it’s easy to take it to different areas of your house and out and about if necessary. A travel play mat can be a handy item to take in the car if you are going away for a couple of days or heading to grandma’s house and this is extra easy with a folding play mat. Material – some material used in baby products can be questionable. Ideally, you want to buy a non toxic play mat for babies. There are also some good organic play mat options. 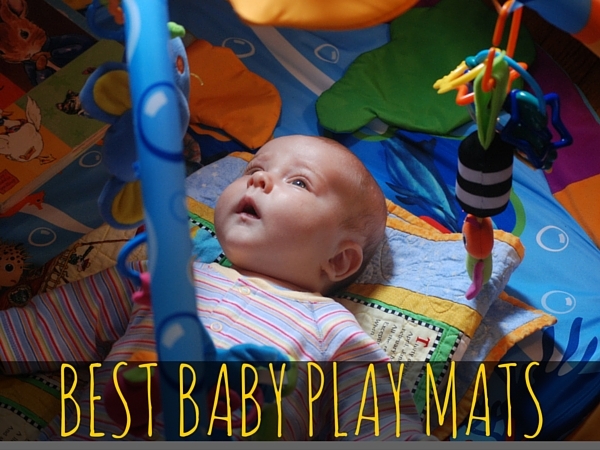 Below are our reviews of our picks for the best play mats for infants. If you’re looking for an activity mat for infants that isn’t too “in your face”, and doesn’t have endless flashing lights and sounds, then this is a great choice to go for. There are over 15 activities to support your child’s development, and the quilted, soft material provides a comfortable place to rest. There are five toys dangling overhead from the cross bar, and for all-important tummy time. There is also a bolster pillow which adds extra comfort. The mat can also be used as a changing mat, if you remove the overhead arches, so you get two for one in terms of your cash. Read more about the Skip Hop Alphabet Zoo Activity Gym and see the latest prices here. As the name would suggest, this particular Tiny Love play mat is packed with lights and music to engage your little one, and is a great choice of elephant play mat, because it features all the favourite wild animals on it as decoration, such as giraffes, zebra, elephant, and lion. The Tny Love Gymini also has a large mirror to keep your baby entertained, and a plastic rattle. This is a great choice of play mat for newborn children, as it is packed with music and sensory developmental fun. The mat plays popular nursery music, and is colorful and engaging, supporting motor skill development, in terms of stretching, reaching, twisting, rolling, etc. Read more about the Tiny Love Lights and Music Gymini Activity Gym and see the latest prices here. 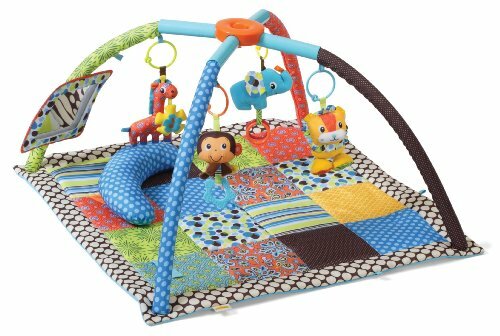 If you’re looking for a play mat you can use for travel, this Infantino play mat is the ideal choice to go for. The mat folds up easily and is compact, so you can take it with you wherever you go. 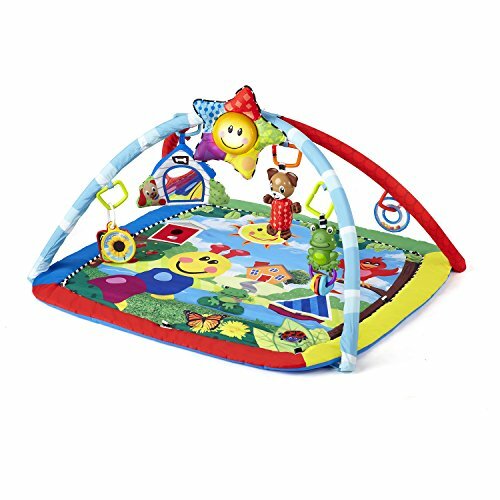 There are four toys in this Infantino activity gym which are linkable and can be mixed and matched, depending on what your little one prefers, as well as a pillow which pops up to support your child during tummy time, and for extra comfort. 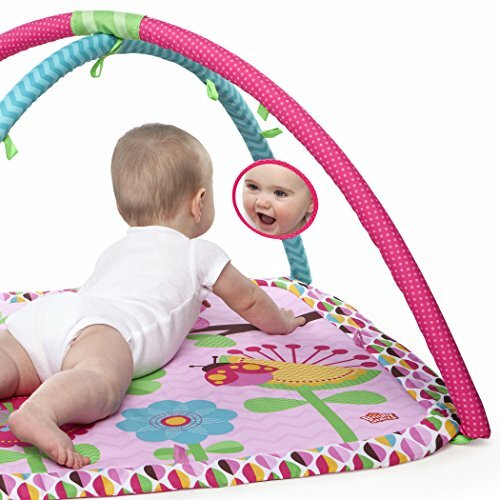 There is also a large mirror, and overall if you are searching for the best activity mat for babies, this is certainly a contender, as it is gender neutral, meaning you can use more than once if you have more than one baby! Read more about the Infantino Twist and Fold Activity Gym and see the latest prices here. There are countless play gyms for babies on the market, but this one stands out because it is so engaging. We know that Baby Einstein is a big name, so you are instantly reassured you are dealing with quality, however the busy nature of the mat means your little one will certainly be entertained for a good portion of time. There are six activities on offer for entertainment in this Little Einstein play mat, as well as music and dancing lights. There is a star-shaped toy which can be detached, with lights, and eight melodies, as well as a plush dog toy, a rattle, image cards, and a frog rattle, with a water-filled teether. Basically, this is an action-packed farm play mat. Read more about the Baby Einstein Caterpillar and Friends Play Gym and see the latest prices here. This is a musical play gym for infants, which will keep them entertained for plenty of time! There are many play rugs for babies which just have toys to grab or noises to make, but the piano on this particular mat plays different notes when kicked or when the keys are touched. There are also five toys on the overhead padded bars which can be detached. The mat needs 3 x AA batteries and is suitable for newborns upwards; perhaps this is a good choice for the younger infants out there, as it doesn’t have so much room to move around. However your baby will probably be so entertained they won’t feel the need to move so much! Read more about the Fisher-Price Kick and Play Piano Gym and see the latest prices here. Obviously this is a girly choice, and one of the most popular pink play mats for babies on the market. You are also doing your bit for charity when you buy the Bright Starts play gym, as it supports the Pink Power Mom Program, benefiting breast cancer charities. Three batteries are needed to help the Bright Starts play mat function, with four melodies played for entertainment. The mat itself is plush and comfortable, and the overhead bar has toys dangling from it, with a colorful plush owl, a teether in the shape of a flower, a heart shaped rattle, and a ladybug bead toy. This is one of the most colourful plays mats for babies for floor when it comes to girly choices. Read more about the Bright Starts Charming Chirps Activity Gym, Pretty in Pink and see the latest prices here. What’s your best baby play mat?